Spain is a beautiful country with so much tradition and the rich economy and good casinos too that attracts most of the outsiders. Like most of the places, this country is also rich of immense traditions customs and the festivals. People living here use to enjoy their popular festivals with full enthusiasm and passion which increase the beauty and value of the celebration. Through this post I tried to highlight the fragrance and the aroma of this lovable place so that the people worldwide will also become familiar with this place of so much love, affection and happiness for the festivals or ferias (word by the local people). All the festivals have some intrinsic meaning, story or a purpose to celebrate. If we talk regarding the varieties of festivals available, the most common and beautiful festival is the Carnival of Santa Cruz de Tenerife. It is held each year in the February. The main beauty of this game is the colorful and amazingly designed costumes. The ladies wearing these incredible dresses use to perform the eye catching dance that enchants each of the audience and entertain them the most. To carry such a heavy weight costume that weights about more than 100kgs it takes a long and rigorous practice of many months. Also the music they select is of the taste of the residents and is really energetic. The other festival is the San Fermin which involves Bull Run. It is a quite interesting game which starts at 8 in the morning and continues all over the bull ring. People love to take part in this event and race with the angrybull with all their strength. It is of big risk of the injuries. 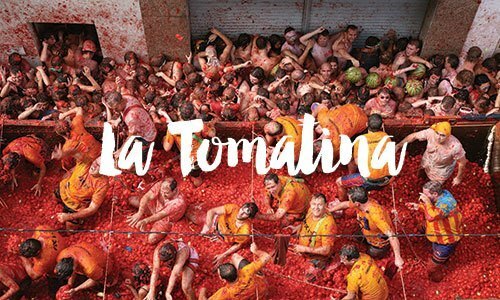 The Tomatina is another festival of so much fun where people use to throw tons of ripe tomatoes for one hour. This is like a game but no winner as this is only played for fun to make each other red keeping in mind that tomatoes must be squished before throwing them to anyone. And the best part is that there is no specific way. You can simply grab and throw it to each other in any way, via running, moving or standing still. You have to only enjoy and treat this as a way of being happy, just to celebrate the day with people around.